The Lake Planning Handbook was developed by the Federation of Ontario Cottagers’ Associations, the Haliburton Highlands Stewardship Council and French Planning Services Inc. It was created to assist shoreline people in both engaging and supporting the members of their community in strategic planning and stewardship initiatives. 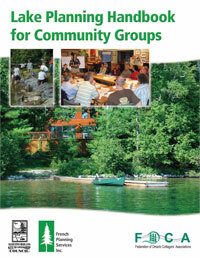 It is based upon the collective experience of over 40 lake associations across Ontario. FOCA would like to thank the Ontario Trillium Foundation for providing a generous grant that has made the development of the handbook possible. The Lake Planning Handbook helps waterfront property owners and associations in building the important relationships around their lakes, lake plan development and implementation, and responsible stewardship practices. The handbook is a 65 page self help guide with advice, ideas, and question and answers about lake planning, project management, communications. It also includes support materials such as example templates, lake plans, surveys, workshop agendas, presentations, and more. Support waterfront property owners with community engagement, lake planning, and implementing actions in their communities. Gather input and feedback from volunteer lake communities to develop a toolkit of best management practices, advice, and resources to support lake planning and stewardship. Create a cost effective resource that is accessible and applies to waterfront communities across Ontario.